Summary: As one commenter put it, this is as close to an all-round multi-gym that you’ll find for less than a grand. The Marcy Eclipse is big, versatile – and has a ton of safety features built in. Stops allow up to lift with confidence, and aircraft level cables (which can take 2000lbs!) are used. The bench is adjustable and detachable. To top it all, both Olympic 2” or regular 1” weights can be used. There is a diagram with arrows pointing to all the key features over on the amazon.co.uk product page. Check out this impressive list for yourself! You’ll get aa big unit – it is 215cms tall at the highest point (the pullies on either side), 249cms deep and 150cms wide. Assembly is required, the day when they post fully assembled gyms is still not with us! The total shipping weight is 175kgs. Marcy use carbon-steel in the construction, with aircraft cables, chrome glide-rods and striker plates to protect the front from free-weight dings. As you’d expect from a Marcy Home gym, the overall unit looks amazing! The bench is removable, and has 4 settings from flat to upright. You’ll even get multiple storage points, small details which make a big difference while you work out. This gym complies with the respected, ‘EN-957’ global safety standard. 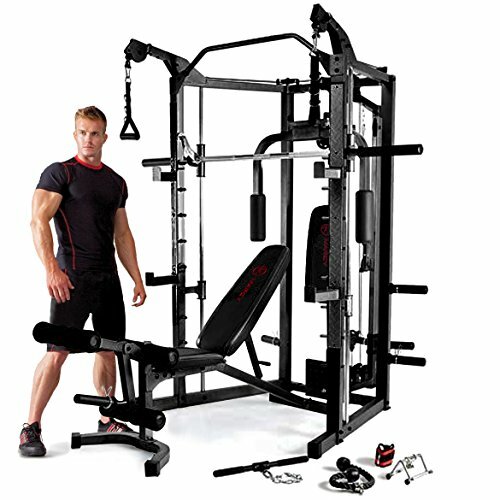 What Can the Marcy Eclipse Deluxe Smith Machine Do? You’ll get a chary with this unit which shows 32 different workouts. Instead of listing every variation, I’ll give an overview of the main exercise groups here. For presses you have a choice. There is a built in Smith, and pegs which allow you to use free weights. These cover a wide range, so you can use them with the bench of for squats. There is a leg press (no excuses for skipping leg day), and a pec dec. A great touch is the dial swivelling high pulleys. You can use these for pull-downs and more. The icing on the cake? An integrated pull-up / chin-up bar. This is a seriously spec’d gym – I recommend you check out the exercise chart and the annotated picture of the gym on the dedicated amazon page – you’ll be impressed. A couple of quick notes. You need to think about the floor before you get this gym put together! A couple of heavy duty rubber matts will fit the bill. Leaving this until afterwards will be a lot more difficult! Second, you’ll need weights. Olympic 2” plates work best, though you can also use 1” plates if you already have these. Only a few comments to go on, and all positive so far. Buyers were impressed with the build and versatility. I like to look for criticisms, and one that made me laugh was that the instructions for assembly looked like they were drawn by a 3-year-old. This does already beat IKEA instructions for me! The versatility of this gym gets praise. This unit really will cover everything. If you have the space, then there are no gyms for under a grand which are as impressive as this one. This covers safety, build quality – and of course, the sheer number of exercises possible using it. The flexibility, small touches like pegs + Smith for the press and double pull-down pulleys make this a winner. Check out the exercises chart and full spec for yourself, if you are not impressed, I’d like to know why!? !